Be an advocate for allergy patients, join us on Facebook! View the FAAIS epinephrine training video for school administrators and nurses. Search for an Allergist near you. An Allergist / Immunologist is a physician specially trained to manage and treat allergies, asthma, and primary immune deficiencies. After completing medical school, physicians undergo at least three years of training in either internal medicine or pediatrics and pass the certifying exam of either the American Board of Internal Medicine (ABIM) or the American Board of Pediatrics (ABP). Internists and pediatricians interested in becoming an allergist / immunologist then must undergo an additional two to three years of study, called a fellowship, in an allergy / immunology training program. Our Society exclusively recognizes programs accredited by the Accreditation Council for Graduate Medical Education (ACGME). Allergist / immunologists listed as ABAI-certified have successfully passed the certifying examination of the American Board of Allergy and Immunology (ABAI). Read our statements below for the FAAIS's official stance on issues relevant to our doctors and patients. Going forward, one of the major components of our work will be to join forces with those individuals dedicated to helping the cause for sufferers of these diseases. We intend to interact with the media, the legislature, and insurance companies when we feel an important message must get out. 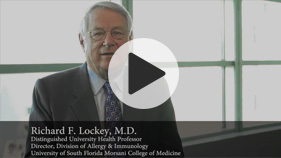 The Florida Allergy, Asthma & Immunology Society (FAAIS) was established in 1949. Its mission is to promote the highest quality, evidence based, specialty care for patients with allergy, asthma and immunologic diseases. FAAIS provides cutting-edge education to its patients, its members and to the health-care community at large while promoting the advancement of the specialty of allergy, asthma and immunology in the great state of Florida. The FAAIS 2019 Annual Meeting will be held at Disney's Grand Floridian Resort in Orlando, Florida on July 19-21.